Anyone can become a member at PenFed Credit Union! Click here to learn how you can join. Becoming a PenFed Credit Union member is easy! Save up to $338 now! 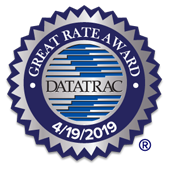 Orange County's Credit Union savings deposit rates are up to 13% better than the average earning a Datatrac Great Rate Award. How can Datatrac help you find the best auto loan? Datatrac takes the guesswork out of shopping for your next auto loan. We are an independent, unbiased research company that has been comparing banking products for over 25 years. Our database of 1,648,658,012 deposit and loan rates is updated daily with the most current rates for nearly every bank and credit union in America, including those right in your backyard. We look at each bank's rates, fees and all the fine print to make sure we are comparing apples to apples. Then we do the math. We compute the savings to help you make the best decision. We stay with you until you find a loan that saves you money.